Steam School is hosting a special broadcast on 17th January at 12:30pm with the UK Space Agency. On Tuesday 4 December 2018 SpaceX launched its Dragon cargo craft from the Kennedy Space Center at Cape Canaveral on a Falcon 9 rocket. On board will be the first UK-led experiment to head to the International Space Station, which uses worms to look at muscle loss in space and could lead to new treatments for muscular conditions for people on Earth. 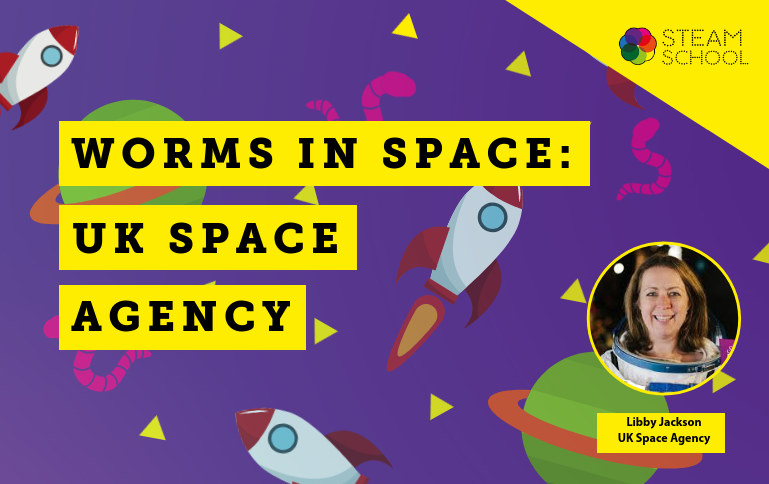 Join our guest Libby Jackson, Human Spaceflight and Microgravity Programme Manager at the UK Space Agency to learn about this exciting scientific programme. Libby Jackson is one of Britain’s leading experts in human spaceflight, having spent over a decade working at the forefront of the field in mission control and management roles. Libby joined the UK Space Agency in 2014 and currently manages the Human Spaceflight and Microgravity Programme at the UK Space Agency. Previously Libby led the hugely successful education programme for Tim Peake’s mission to the ISS, as well as acting as a spokesperson throughout the mission. Libby has had a life-long interest in human spaceflight. Do you have a child who loves to learn about space, science and technology? Perhaps they might like to ask Libby a question for our show! Already a Steam School member? Want to find out more about Steam School?